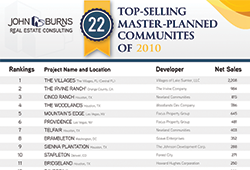 Every year, John Burns Real Estate Consulting, LLC ranks the top masterplans in the country based on new home sales. Feedback from numerous industry contacts and our boots-on-the-ground consultants supports the diligent research that goes into producing our prestigious, annual ranking. Congratulations to the leadership at all 50 top-selling communities, who sold at least 320 homes per community last year—nearly one home per day and slightly higher than in 2017. 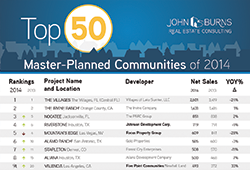 Roughly 28,500 home buyers purchased new homes in these top 50 masterplans in 2018. 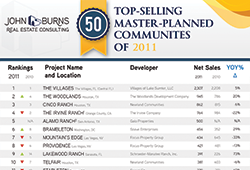 What Makes the 50 Top-Selling Masterplans So Successful? If you have questions regarding any of the ranking communities, or if you know of a community that should be considered for future rankings, please let us know. 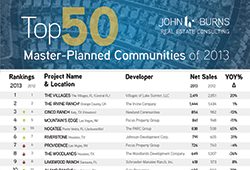 Schedule a call with one of our advisors regarding our Top Master Planned-Communities Rankings by filling out the form below. 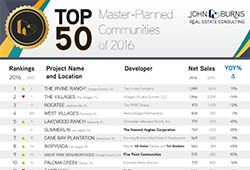 Masterplan developers have learned that they can achieve even more sales and higher prices by joining forces with adjacent land owners to create larger master-planned communities with scale. By working together, they can create a larger community with more name recognition, more activities, and economies of scale. Boomer masterplan developers still don’t understand us millennials. Their marketing tries to entice us with their version of cool: the flashiest new gadget, the most up to date home technology, or a community social connection. Our research (and my own personal experience) shows that we value organic, unplanned, authentic, and experience-based housing amenities the most. 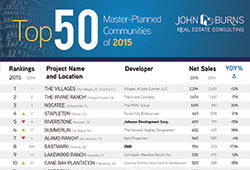 Pools, playgrounds, and clubhouses are no longer enough to lure home buyers to buying in a new home community. Today’s masterplan developers increasingly focus on making life convenient and enjoyable for their residents. Velodromes, tree houses, zip lines, and even zoos have become hot new amenities for successful master-planned communities. 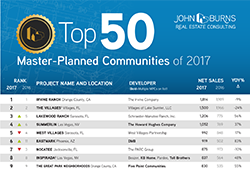 During our survey of more than 270 master-planned communities for our annual ranking of the 50 top-selling communities, we discovered numerous jaw-dropping amenities. Ever wonder why the majority of mega masterplans are clustered in the “smile states,” those that line the coasts and southern portion of the United States?